All software updaters tell you when new versions are available. With Ninite Updater it's just one step to automatically download and install all your updates in the background. Other updaters just give you links to installers which you need to download and run by hand for each and every app. Other updaters are anything but free when it comes to your time. Ninite Updater starts at just $9.99 for one year on a single machine. Update checking happens in the background. No need to launch a checker app again and again. Apps should be detected automatically. No need to select them or install software a special way. You can install all your updates at once. Fully automatic. No downloads to manage or organize. No clicking Next Next Next in installers. Updates come without browser toolbars or other annoying junkware. Your desktop shortcuts are not changed. If you don't want to update one app, you can skip it and update the rest. And that's exactly what we've built with the Ninite Updater. It's how software updates should have been all along. Your PC's software is automatically detected and the Ninite Updater alerts you when any of the 92 Ninite-supported apps become out of date. It doesn't matter if your apps were installed with Ninite or not. The Ninite updater is smart and includes Ninite's powerful software detection technology. It even notices when you add new apps to the system, there's no need to rescan your PC or update any configuration information. It just works. When software needs to be upgraded the Ninite updater displays a simple notification. Then, with one click, you can launch a Ninite installer to upgrade the software without any further user intervention. No websites to visit or downloads to manage. No clicking Next. No worrying about getting toolbars or junkware. It's totally painless, just like Ninite installers. Ninite Pro is used by IT professionals to manage software on tens of thousands of machines each month. The Ninite Updater is based on the same technology the Pro's use, but packaged in a simple client you can install on a friend's PC and then forget about. With our multiple-license family packs there's never been an easier way to make sure the computers you manage for the people you care about stay updated and secure. Security exploits make it critical to keep software up-to-date. But confusing download sites and installers full of pointless questions make updating a chore that gets put off for later. 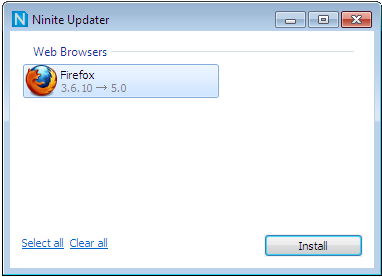 The Ninite updater removes the pain from application updates. It just takes a simple, single click on the Ninite Updater to get the latest security patches and application updates. One year of Ninite Updater for one machine is just $9.99. There are no monthly fees and no hidden charges. It's simple, just $9.99 for one year on one machine. We also have options for people who want to use the Ninite Updater on multiple PCs. Aren't there other free updaters? Sure, but they don't work like Ninite Updater. With Ninite Updater it's one step to download and install all your updates in the background at once. Other updaters just give you links to installers and you need to download and update each app by hand. They're anything but free when it comes to your time. I help a bunch of people take care of their computers. Can I use Ninite Updater on their PCs too? Yes. Just get one of our discounted family packs and you can install the Ninite Updater on your friends' computers too. If you do a lot of IT support Ninite Pro might be a better fit though. No. Home users told us that they don't like paying for software every month, so we sell Ninite Updater at a low price for one-year terms. Does it only work with apps I installed using Ninite? Nope, it doesn't matter how you installed the apps. Ninite Updater will automatically detect and work with any of the 92 supported apps listed at ninite.com. Can I use a family pack for business? Sure, we think Updater is a great way for small businesses to manage software on their PCs. For more complicated networks or setups Ninite Pro is definitely worth a look too. Does this include an account or login? No. When you buy the Updater we redirect you to your custom download link and also email you a copy in your receipt. People already have too many online accounts to keep track of and we don't want to add to that. Is Updater included in a Ninite Pro subscription? No, but Ninite Pro users can accomplish the same thing by running a Pro installer with the /updateonly and /disableshortcuts command-line switches.